It seems that life has become more complex and complicated leaving us with less free time to savor and appreciate each moment. Luckily we have it within our power to stop this trend by creating a less chaotic, more balanced and enjoyable life - starting now! Get rid of unnecessary "stuff" by prioritizing. Decide what is really important to you and then begin to get rid of some of the clutter you've probably forgotten about over the years. We often tend to hang on to things for emotional, nostalgic or other attachment reasons. If an object no longer has a practical function or is worn, it's time to consider throwing it away, or if it still has value, donating it to charity. It is safe to say that if you haven’t used an item for over two years, you're probably unlikely to. Clean up. You'd be surprised what you can find when you decide to thoroughly clean your closets, hidden nooks and rarely used spaces. I have found things I don’t remember purchasing hidden in the back of my closets. The worst part for me is that I have bought particular items for a second time forgetting I already had one. Not good from either an economic, or decluttering perspective! Get organized. Streamline and simplify your life by setting up routines for the necessary tasks in your day such as cleaning, paying bills, doing groceries, etc. Stay organized by making a short to-do list daily, putting things away immediately, allotting time for each task and staying on top of things. When everything is in its place, not only is your living space open and uncluttered, so is your mind. Assess how you spend your time. Decide which actions and activities are important to your lifestyle and prioritize them as well. Resolve to only engage in those that matter to you; do not waste time on those that do not. Design your day to correspond to your priority activities. Learn to say no. Quite often we get ourselves entangled in situations where we take on far too much leaving us little time for ourselves. Certainly, it is wonderful to help others, however, we have to know where to draw the line. If we do not, our own lives can get cluttered and unmanageable. Limit social media, television watching, video game playing, etc. Certainly, television watching, the Internet, video games etc. have become very pervasive in our lives. While they each have their proper place and relevance, it is importance to not let media dominate our lives and usurp our time. Simplify your life by not letting it take it over. Give up multi-tasking. Recent research conducted at Stanford University has shown that multi-tasking actually lowers productivity and increases stress levels. Your performance suffers because the brain can really only focus properly on one thing at a time. Doing one thing at a time, and doing it well, will not only simplify your life, it will enhance your enjoyment of it. Declutter relationships. Endeavor to spend time with those you really care about and whose company you enjoy. Quite often we are thrown into social situations with people with whom we have nothing in common. We sometimes we believe if we decline that party invitation, or if we aren’t seen at the latest fashionable gathering place we will miss out somehow. Not so. Instead, simplifying your life and engaging in what makes sense yields greater peace and well being. Re-evaluate your buying habits. Much of our clutter comes from buying the wrong things and buying more than we need. Unwittingly, most of us have become brainwashed into thinking we need bigger and more of everything - more food, more clothing, bigger cars, and bigger houses. The media has done a good job of making us believe we must spend more money for more "things" only to have us end up less happy and with less time to enjoy ourselves. It's time to re-think what we really need vs. what we ill advisedly continue to spend our hard earned money on. Learn to relax. No matter how much you simplify your life there will be times of stress. For such times, engage in the tried and true methods of relaxing including exercise (walking, swimming, a sport you enjoy), practicing mindfulness, reading, listening to calm music or anything else that takes you to a restful, quiet place. 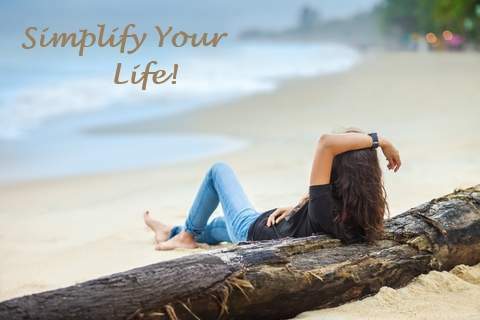 Simplifying your life will help to lessen the more unfavorable effects of living in the fast paced, minute to minute ever changing world where we find ourselves today. By taking control, we can set our own pace and in the process live healthier, happier lives.